Available as end cap or free-standing whole bean coffee merchandising systems, these beautifully designed, elegantly appointed "Coffee Centers" will increase your square foot coffee bean sales by as much as 25%. 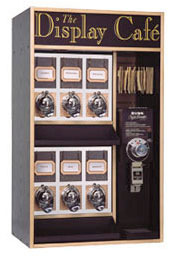 These unit feature our unique metal display and dispensing bins, complete with stainless steel construction, chrome frames and durable, chrome plated "free flow" rotating dispensing ball systems in single or "double-decker" models and your choice of hammered brass, chrome, bright or antique copper face plates and coordinating name tags. Our retail fixtures attract customers' attention with their back-lit signage, and encourage impulse purchasing with overhead product enhancing "spotlights" and multiple merchandising options. In addition, our systems include locking pull-out drawers for convenient hidden storage of overstocks. Their well lit open shelves are designed to ramp up sales volumes of line-extension and seasonal merchandise.